My younger sisters loved playing with their dolls! They’d brush their hair for hours and dress them up. And they especially loved pushing their dolls around in the best doll stroller for their particular sized doll. One of my sisters loved the bigger baby dolls and was thrilled when Santa Claus brought her a foldable doll stroller. My other sister loved the smaller Barbie dolls and since pink was her favorite color, she wanted a pink doll stroller so she could take her dollies for a ride. Like my sisters, lots of little kids love taking their dolls for a ride in a doll stroller. For that reason, our team has carried out in-depth research so we could handpick an awesome selection of the best dolls strollers. We’ve got strollers in different colors and sizes. Umbrella strollers and pram-style strollers. No matter what your kids like or what size doll they have, we’ve got you covered. We’re confident that you’ll find a doll stroller on our list that your child will be thrilled to receive as a gift, no matter what the occasion! Children love hauling around their dolls and stuffed animals in anything with wheels, making this First Umbrella Doll Stroller from The New York Doll Collection a great toy for your toddler. This cute little stroller is made of a mixed denim fabric and comes with a seat belt to hold your child’s doll in the seat for those walks in the yard or through the park. It has double wheels on all four legs to make the stroller more stable, and it folds up for easy transport or storage. And it has two umbrella style handles. Best of all, it is made from BPA FREE materials and comes fully assembled. This doll stroller will fit numerous doll sizes, up to the size of an 18 inch doll. This Umbrella doll stroller is recommended for children age 3 years and up, but many parents mentioned that this stroller works well for children from 18 months to 6 years. Parents shared that they bought this doll stroller for both girls and boys. Many parents find that young boys load up the seat of this stroller with a lot of items other than dolls, such as small cars, rocks, and even building blocks, making this stroller useful for more than walking that cute little doll. This my First Umbrella Doll Stroller is a fun toy for your child to use with their favorite dolls. Kids loves this gorgeous umbrella doll stroller and have great fun pushing their dolls and stuffed toys around! 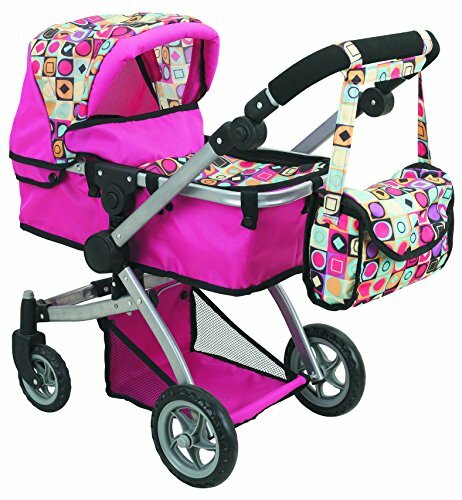 This Joovy Doll Caboose Tandem Stroller comes in either pink or blue dots. It features a 2 position front doll seat and snack tray and a car seat adapter (for the Jovy Toy Doll Car Seat), Double front wheels, an adjustable 5 point harness, and 2 position foot rest. The rear of this stroller features a rear platform and bench style seat with the seat having a 3 point harness. It also has a storage basket and removable canopy, as well as a stand on platform. In addition, it has a padded handle for more comfort for your young child’s hands. This stroller fits dolls up to 20 inches and will easily hold 2 or 3 dolls. It also collapses when not in use, allowing for easy storage. This stroller is recommended for children 2 years and up, but parents find this stroller works well for older children even ages 8 and 9. Children can place a doll in each seat and even stand one on the platform. This Joovy Toy Doll Caboose Tandem Stroller is a great fun for children who want to walk more than one doll at a time. The storage basket has plenty of room for carrying a doll blanket or other doll accessories. Kids have great fun with this doll stroller and love that it will hold more than one doll! The Deluxe Doll Stroller by Doll Stroller Pro is a great little versatile stroller for your young child. This stroller for dolls can be either be raised to stroller position or can be laid back to be a baby buggy. It features swiveling wheels, an adjustable handle and a carry (diaper) bag. You can adjust the handle up to 27.5 inches. Your child will be thrilled that the doll stroller also has a bottom basket for storage and a hood that opens and closes. The bright pink fabric can be taken off and machine washed. Th Deluxe Doll Stroller folds up for easy storage and it is easy to assemble because you only need to put on the wheels. This doll stroller is recommended for children ages 3 years and up, but most parents agree that this stroller is great for kids ages 6 years and younger. It’s perfect for 18 inch dolls or stuffed animals although in buggy form, it can actually be used for toting around all sorts of items. Parents find that their children love to pile all sorts of small stuffed animals or dolls, blocks and assorted other toys into this doll stroller and push it around. This Deluxe Doll Stroller is versatile and fun and great for encouraging your child to spend time out of doors walking their ‘babies’. Kids love the fact that this doll stroller can be transformed into a buggy too! The Vtech Baby Amaze 3-in-1 Stroller changes from a doll stroller to a high chair complete with tray, to a bassinet, and provides a lot of different interactive ways to play. There are buttons that introduce numbers and colors as well as playing piano sounds. When the stroller is moved, it plays various sing-a-long songs. When in the high chair position, your child will hear phrases regarding baby care and nurturing. When you turn the high chair into a bassinet, your child will hear lullabyes and nursery rhymes as their dolly falls asleep. This stroller takes 2AA batteries and includes a doll. It will also hold other 14 inch dolls. While this stroller is recommended for children age 2 to 5, many parents find that one year olds who are walking can use this stroller quite easily. They also like that the included doll is soft and can be washed. Parents like that their child can enjoy playing with this stroller/high chair/bassinet and doll while learning to count, learning the name of animals and other things, making this stroller both educational and fun for their toddlers. This Vtech Baby Amaze 3-in-1 Care and Learn Stroller is a great toy for early learning while providing hours of fun for your child. 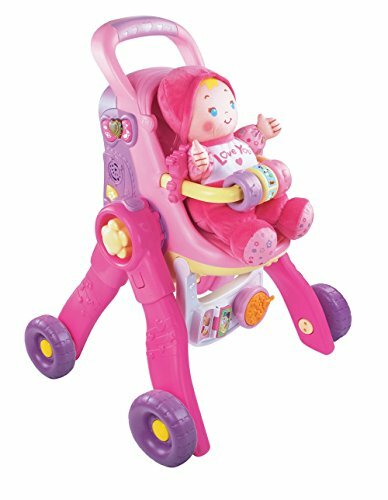 Doll stroller is fantastic fun for kids, both as stroller and for the music and songs that are played! Your child gets 3 toys in 1, giving you great value for money! This New York Doll Collection My First Doll Stroller is the perfect stroller for those parents looking for a stroller that is not overly girly. 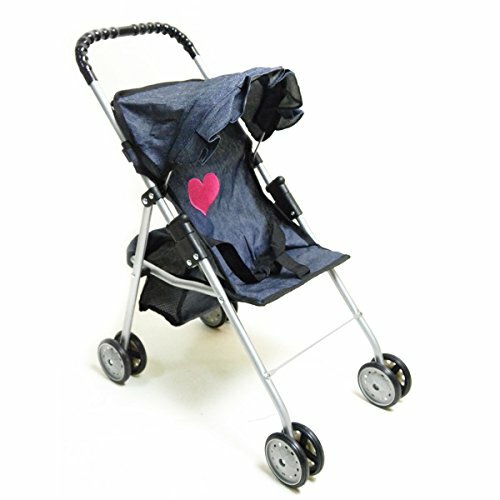 Made from sturdy denim material with a pink heart on the back, a denim hood, seat belt, basket on the bottom, and double wheels on all 4 legs for added stability. This doll stroller also folds up for easy storage or transport. Measuring 20.5” X 10” X 20.5” the stroller will hold baby dolls up to 18 inches long. The stroller comes fully assembled and ready for use. Due to the less feminine look of this stroller, young boys as well as girls like to play with this toy, and may spend hours a week giving their dolls or stuffed animals rides throughout the house or the driveway. Parents find that this doll stroller became a favored toy of their toddler who love being able to take their dolls and other toys for a ride indoors and outdoors. The basket on the bottom is perfect for holding your child’s snacks or accessories for their doll. If you are looking for a doll stroller for your toddler, the My First Doll Stroller may fit the bill due to its size and durability. Kids have a blast pushing their dollies and stuffed animals around in this cute stroller! 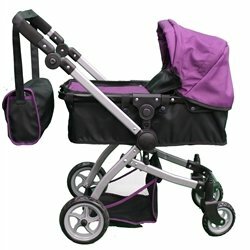 The BabyBoo Deluxe Doll Pram comes in bold purple and black that is really eye catching without being overly feminine. The bottom of the pram can be set in 4 different positions, from laying down like a baby carriage, to sitting up in a stroller. This doll pram has an adjustable handle that adjusts up to 27.5” high, 13” wide and 27” long so you can adjust the handle for different size children to use easily. This doll pram/stroller also has swivel wheels which makes steering easy for your child. It also comes with a bottom basket and an attached carry/diaper basket. The hood opens and closes so your child can shade their baby doll or let them enjoy a bit of sunshine. This baby carriage/stroller is extremely realistic looking and is suitable for children age 3 up to 7 or 8 years old. When in carriage mode, many children like piling the pram full of dolls and stuffed animals and giving them all a ride at one and the same time. The pram will hold dolls that are 18 inches and under, and you may be able to fit two smaller dolls into the pram at one time when in stroller mode. The BabyBoo Deluxe Doll Pram is a great toy for any child who loves dolls or stuffed animals and gives them another way to enjoy those dolls while engaging in imaginative play. Children love this pram style doll stroll and have wonderful role playing fun taking their dollies for a ride! 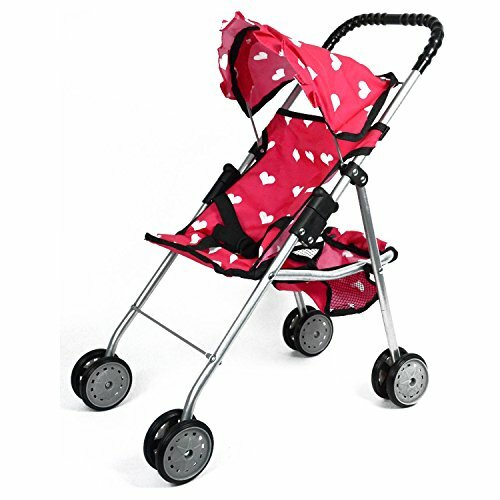 The Precious Toys Pink and White Polka Dot Doll Stroller with its silver colored frame is certainly eye catching and feminine. This doll stroller comes fully assembled and has a foldable hood and seat belt with double wheels on all 4 legs. It also has a little storage basket under the back of the carriage which your child will love using. This stroller measures 22.5” X 10” X 20″, is Lead FREE and folds up easily for storage or traveling. The Precious Toys Stroller will accommodate dolls up to 18 inches and is recommended for children ages 3 years and up, but most parents shared that they found it’s best suitable for children ages 18 months to 4 years. Children any older than four will have to stoop in order to push this carriage as it is not very large. A few Day Care Centers have purchased this pink and white polka dotted doll stroller and shared that is a big hit with children in their Day Care. 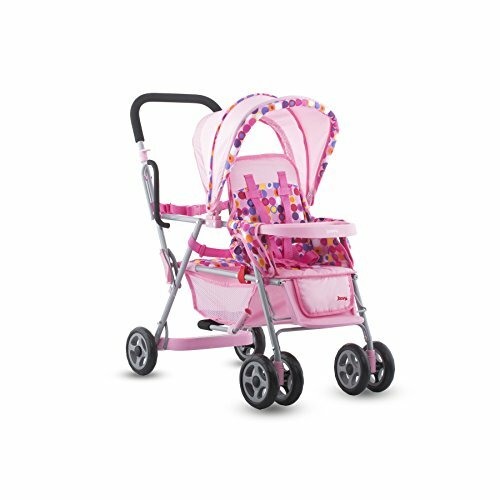 Although the strollers colors are ultra feminine, boys like to play with it as often as the girls do. The Precious Toys Pink and White Polka Dotted Foldable Doll Stroller is a fun stroller perfect for younger children to engage in imaginative play. 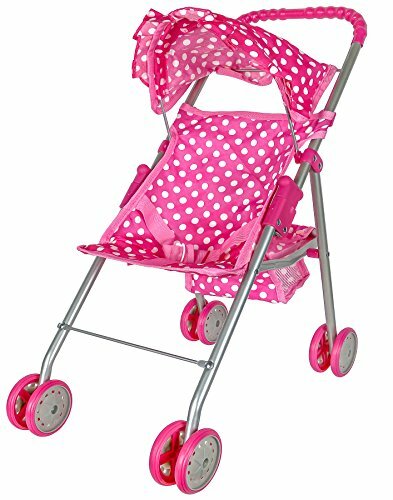 Cute doll stroller with it’s bright polka dots that kids love playing with! 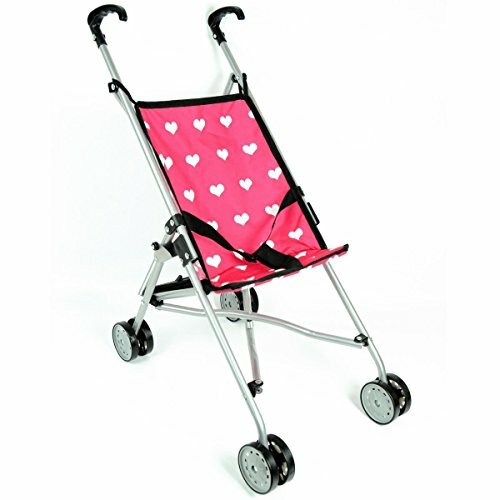 This pretty pink Hearts Umbrella My First Doll Stroller with white hearts, black trim and metal frame makes a perfect first doll stroller for any toddler. The stoller features 2 umbrella handles, a seat belt, and double rubber wheels on all four legs for added durabilty and easy rolling. It measures 16” X 11” X 22” making it the perfect size for smaller children and 18 inch dolls. Best of all, it comes fully assemble so all you the parent has to do is open it up and its good to go making it great for gifting! While the stroller is definitely feminine looking, parents have discovered that their little boys like to play with it too. Not only do toddlers give their dolls and stuffed animals rides in this stroller, but also assorted other toys as well. This doll stroller can be used inside or outside, and children enjoy taking their ‘babies’ for a walk in the house, the yard, the park or even when shopping with their parents. The stroller is most suitable for children ages 18 months to 3 years. 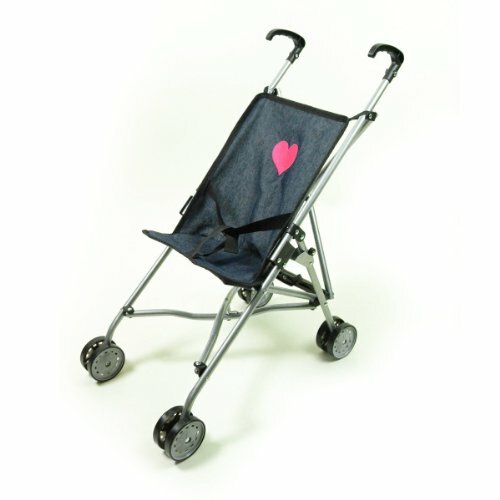 This New York Doll Collection Hearts My First Doll Stroller for kids is likely to become a favorite toy for any child who likes playing with their dolls. Kids love this fun umbrella doll stroller, taking their dolls for a ride and so much more! The Mommy and Me 2-in-1 Deluxe Doll Stroller is designed for older children and doubles as both a pram and a stroller. 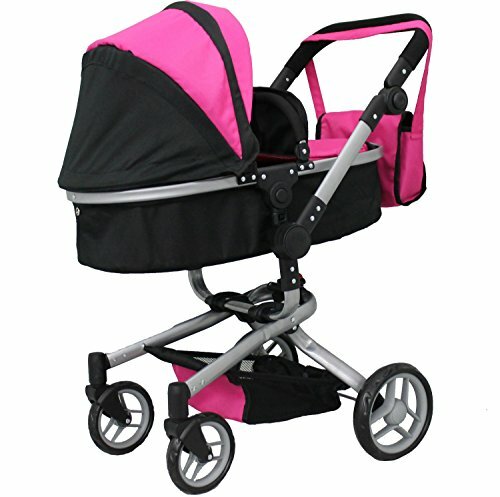 The stroller comes in pink and black and measures 16” X 24” X32” and the bassinet can be removed. This doll stroller features swivel wheels, a bassinet cover, bottom basket and a cute carry bag. The stroller only needs minor assembly, taking only a few minutes. It has also been safety tested and is made using Lead FREE material. The handle of this stroller/pram can be switched from side to side so the doll either faces your child or away from them when going for walks. Suitable for dolls up to 24 inches, it’s recommended for children 4 years and up, but it is also quite suitable for children as old as 8 or 10. Since this doll stroller functions both as a stroller or a carriage, it provides more versatile play for your child. In addition, it holds larger dolls than most of the other doll strollers on the market. This Mommy and Me 2-in-1 Deluxe Doll Stroller is perfect for older children who want a stroller to take their larger dolls for walks in or outside of the house. Kids love the fact that this fun toy is both a doll stroller and a pram! Comes with a cute carry bag which kids love as it allows them to play pretend ‘mommy’ and have a diaper bag! The New York Doll Collection My First Doll Stroller with Basket comes in bright pink with white hearts, a hood, seat belt and an under stroller basket. This stroller has double wheels on all 4 legs, and the handle is covered with rubber tubing so it’s gentler on your child’s hands. Measuring 20.5” X 10” X 20.5”, it fits dolls up to 18 inches long and folds up quite flat for easy storage when the stroller is not in use. The handy little basket that sits under the stroller adds to the fun for your child when they are playing. While this My First Doll Stroller with Basket is definitely colored to appeal to young girls, toddler boys enjoy playing with it as well, loading it with not only dolls or stuffed animals, but also blocks, stones, or other small toys. This stroller for baby dolls can be played with outdoors and indoors, making it more fun for your young child. While this stroller is recommended for children ages 2 to 4, most parents find that children as young as 1 can easily push it. This New York Doll Collection My First Doll Stroller with Basket is a fun easy to use stroller for young toddlers. Super fun doll stroller for girls and boys who love to take their dolls and stuffed animals for a ride! Perfect doll stroller for tiny tots!